This is significantly too big for me with the pattern as written; I ended up making serious revisions which I’ll probably publish as its own pattern. So I tinked back 3.5 rows and kinda started over. Calculated decreases (see photo of notes) and went down to 56 stitches, which seems about right. Started heel flap on slightly rearranged stitches to get the full 1/2-width. Will need to reset after the turn to get the pattern right again. For heel turn row 1: sl1, k15, ssk, k1, turn. Last row is RS, ending with 15 stitches. Starting toe decreases after a row 6 of the pattern. Into the gusset. 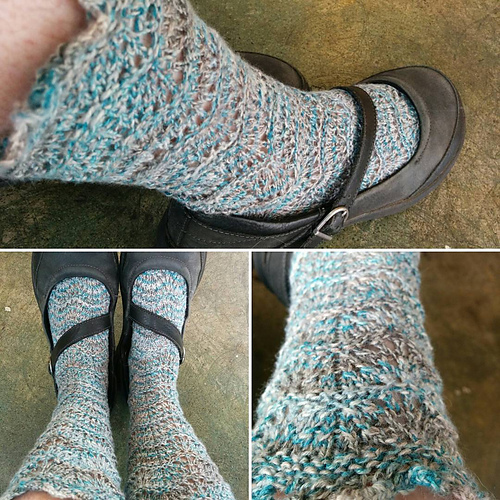 Have been documenting the alterations; some minor differences between the two socks, but I think maybe they can be reconciled for a final version? A weird list from one of my recent obsessions.